The instant when you realize that you are about to be completely and monumentally screwed. A bright, crisp morning greeted James Whitesides (not to be confused with the Irish poet) as he rose from his post at the mission near San Antonio de Bexar. Texas had been good to him; the land was cheap and the humidity made his hair very manageable. The war with Santa Anna hadn’t even wrinkled his disposition. He took a deep breath and open his sleep-filmed eyes. And then he looked to the south…. Alamoment: The feeling experienced by the member of the Daughters of the Republic of Texas who first spied the Texas Attorney General’s fax requesting volumes upon volumes of information to audit the guardians of the Alamo. While it might seem as though it has been some time since I returned to issues plaguing the Alamo and Alamo Plaza, I secretly have been adding updates at the bottom of older posts. For example, in older posts about the Alamo and its plaza you can find out that Sam’s the man currently working on sandwich boards on Alamo Plaza; view the Texas Historical Commission’s reactions to the expansion plans the Daughters have for the Alamo grounds; or link to recent news stories and editorials. I should probably be creating new posts or at least posting these as comments, but then it would seem as though I am talking to myself (which, of course, is what blogging is). After all, I do not want to seem Alamobsessed (one for The Compoundium?). 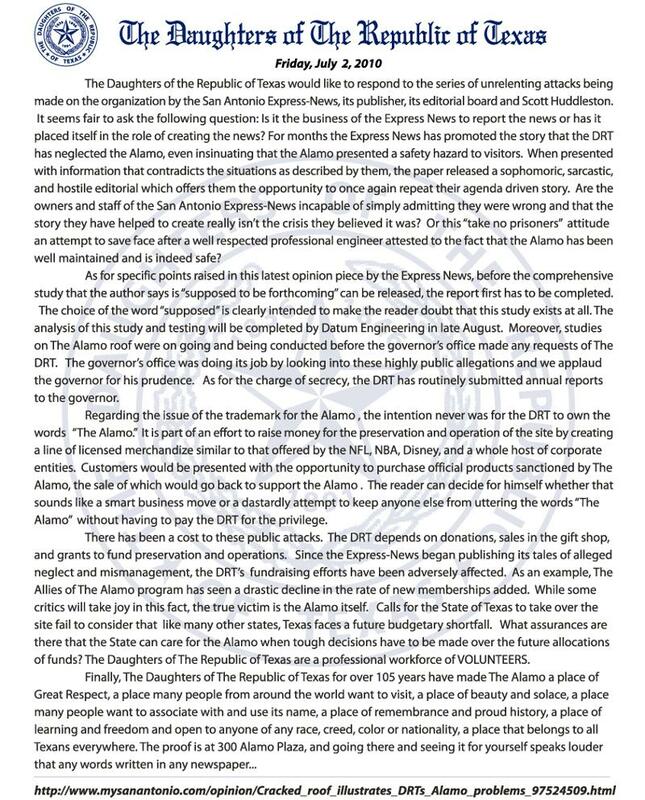 The Daughters also issued a release Friday, accusing the San Antonio Express-News of directing “unrelenting attacks” on the DRT through its articles and editorials. And while looking for a full copy of the Daughters’ release online, came across the unfortunate news of a setback in fundraising for Alamo preservation in the Dallas Morning News. Update Added on July 4: Amazing what Sam Perez has accomplished. Drove through Alamo Plaza yesterday, fully expecting every single sandwich board (see photos here) to be back in place in the face of every single one of the 50,000 AA conventioneers in town. After all, Sam would not be out there enforcing the code over the Fourth of July holiday. But all the sandwich boards were gone, even the ones at the Houston Street establishment next to the Indigo, save one exception: the monster-sized one outside Pat O’s. Way to go Sam! We are still saddled with the unsightly clutter outside Fuddrucker’s and Pat O’s, but this is a remarkable step forward. Now, if only the City Manager can charge an equivalent miracle-worker to enforce the multitude of signage violations filling every window pane along the west side of the plaza…. And the follow-up story in the Dallas Morning News. Second Update on July 7: Brian Myler of KSAT-TV has been working on a story on Alamo Plaza signage violations for weeks and reports the City has been issuing citations. A feature will air during the 10:30 p.m. newscast on Friday, July 9. Phew! The Daughters made the Attorney General’s deadline for mountains of documents. State Representative Leticia Van de Putte weighs in. KSAT-TV Defenders cover illegal signage on Alamo Plaza. Update on July 14: The “daughter” they wish they never had…. Update on July 20: KSTX Radio interviews Express-News’ Scott Huddleston; president of DRT unable to find time in her schedule to join them. Update on July 26: State wants its just desserts à-la-mo-de; opposes DRT trademark application. Update on August 1: This thread keeps going, but it seems so convenient to provide access to the related news reports in one post. Engineering report returned, and editorial on trademark. So we guess we are Alamobsessed with the obscenery dominating the plaza.